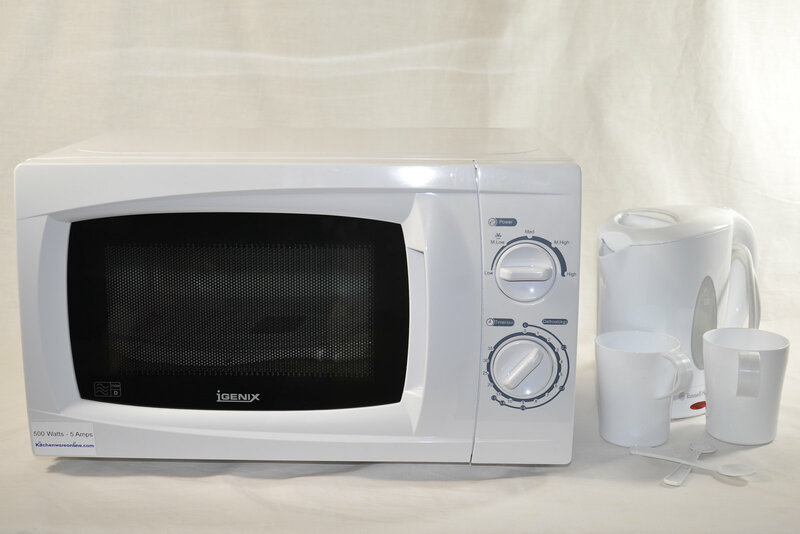 Low power microwave oven and kettle set. Low power microwave oven suitable for use on campsites, ideal for Caravans and Camper vans. These ovens are specially converted in our workshop to reduce the cooking power to 500 watts. This enables them to run from a 6 amp supply without tripping the electric hookup. Needs a 240 volts AC, 5 amp supply, the oven will plug directly into the 240 volt supply using the fitted 3-pin plug (supplied fitted). Low power (650 watts) cordless electric jug kettle. Supplied with a fitted moulded UK 3 pin mains plug, two small plastic cups. Great 500 watt microwave purchased for our Motorhome, just as good as a a higher wattage one and heats meals in no time at all. The little kettle is also fantastic, wish I had known about these for our last caravan which had an ordinary microwave and kettle and made our generator very noisy when it was on and tripped the electric hook up on caravan sites. Would highly recommend the Camping Kit 2. Only tried this kettle once, it boils much faster than I expected. The microwave also has only been tried once, seemed fine. They are to be used in a caravan, which was the reason for buying lower wattage goods.